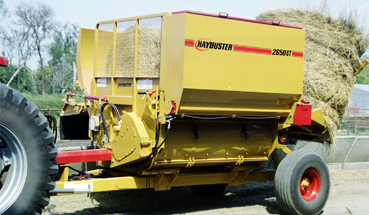 Valley Implement carries a full line of Haybuster's Balebuster Line of bale processors provide solutions for bunk feeding, bedding, range feeding, erosion control and odor control on waste water lagoons. Learn more about Models 2100, 2564, 2650, 2655, 2660, 2665, 2800. The 2800 is equipped with Dual Action Loading Arms to allow for loading square and round bales into the bale chamber with equal ease. Learn more. 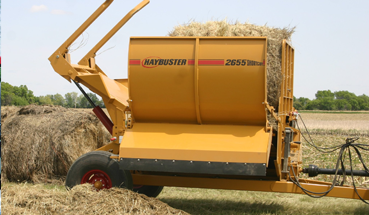 The 2655 speeds up the loading process by allowing each bale to be lifted separately. The bale loader also carries a second bale. Learn more. 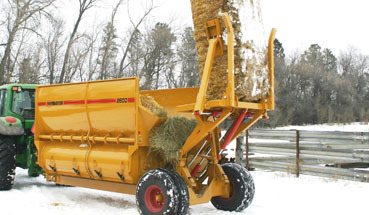 The 2650 shredder chamber will process bales in any condition; wet, frozen, old, new, or with flattened bottoms. Learn more.